The latest hiking news about trails and gear. Basically, anything and everything of interest to a hiker, pulled together into a convenient, easy to read format for you. You can read hundreds of pages of hiking tips right here on this website. frustration in finding time to wade through this bounty of information. Trail Mix monthly hiking digest! If you enjoy the style and content of the Hiking For Her website, you're gonna love this deep dive into all things hiking each and every month. Why is it a "digest"? You eat trail mix because it's delicious and satisfying. Then you digest it and put it to good use on the trail. In every monthly edition, you'll find tempting, easy to digest hiking information on a variety of topics all of us hikers love. You already feed your hard working hiking body with tasty trail mix. Now you can feed your mind with all of this hiking goodness! The hiking trail mix you munch on usually combines an abundance of sweet, salty and surprising savory bites. Every monthly issue is jam packed with articles, crafted to make your hikes satisfying, safe and successful. And offer you the latest discounts, freebies, product changes, new gear and other hiking news you want to know. Colorful photographs of hiking trails and destinations, wildlife, seasonal plants and flowers, and hikers in action in some spectacular scenery are just a bonus! What exactly is in this Trail Mix? Let's take a peek at what you will find in your Trail Mix, based on the "rule of three" outlined above. Beginners, intermediate hikers and seasoned trail veterans all need to plan for a successful hike. And many more topics any hiker thinks about when planning a hike. Over the course of one year, imagine all of the hiking wisdom (seasonally appropriate) you'll enjoy! Once you're at the trail head, you have to rely on your advance planning (see above) for what's in your backpack and in your knowledge base. As a reader, you can always suggest a topic to be covered in an upcoming edition, too. And share your own tips. Whew! Boots are off, and you're cooling down from a great hike. But you might have a few aches and pains, maybe a blister or a rash. And you're probably hungry as a bear! Look for the latest hiking related information in this section of Trail Mix Monthly Hiking Digest. and whatever is hot off the press that month. This summary service is part of what makes Trail Mix Monthly Hiking Digest a news digest, right? Just to keep things interesting, every month there will an exclusive give away, just for Trail Mix monthly digest readers. You can enter to win something that will keep your trail time safe, comfortable, fun and fresh, every month! It's easy to enter the secret password and your email address into the random drawing by the end of the month, and then wait to be contacted if you're the lucky hiker. And who knows what other goodies will be thrown in, just to keep things spicy? Hiking For Her is just getting started mixing up a monthly batch of Trail Mix for you! Right now, Trail Mix is available one month at a time. If there's enough interest, it will be offered in 6-month and yearly subscriptions. You can purchase your monthly edition right here. Fast and easy! Trail Mix is available as a pdf download, available instantly by using PayPal, or a credit or debit card via the PayPal interface. This payment method is safe and secure. Save it and read it at your leisure. Build up an archive of great hiking articles. Print out the articles to make reading even easier. Every issue of Trail Mix is written from the perspective of a hiker in the northern hemisphere. So if you're in the Southern hemisphere, the seasons will be flipped. You pay a low $2.99 per issue during this introductory phase. Why so low for over 35 pages of exclusive hiking goodness plus a give away every month? And here's the real reason: it's something low cost yet tasty to look forward to as the seasons turn and you add more miles to your boots. Future issues will increase in cost as the amount of information (and thus the format, labor and overhead) expands. But there will be a special deal for the first wave of readers, you can be sure of that! Will this fresh hiking information be available here on the website? No. What you read in Trail Mix stays in Trail Mix. No one else will have access to all of these tips, techniques, solutions, gear hacks, give aways, research findings, and trail news. If you decide to skip Trail Mix, no worries! The Hiking For Her website will continue to feature brand new hiking tips for you. Use the RSS feed to stay current. Happy Trails, the free monthly newsletter, will still be emailed, brimming with hiking news and tips. A link to the purchase page for each new edition of Trail Mix will be provided in Happy Trails every month. If you haven't signed up yet for this free newsletter, please do using this convenient little blue box. Makes it easy to get your copy of Trail Mix if you change your mind! There is never enough room in Happy Trails (see above) to share all of the hiking news, reviews, updates, and tips that I gather and create each month. 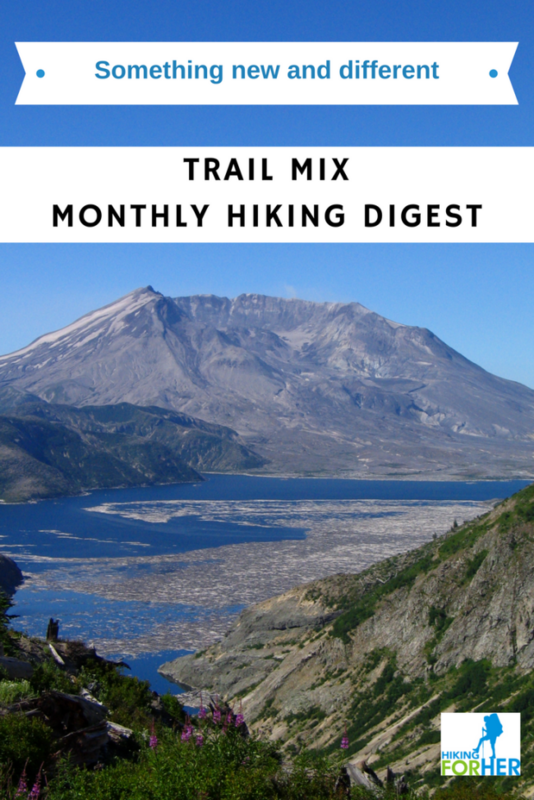 The expanded format of Trail Mix monthly hiking digest provides the opportunity to share a lot more hiking information with you, without clogging your in box. It's fun to pull together "all things hiking" for you in a fresh, easy to read format! And hopefully to surprise & delight you with new ideas, inspiration, solutions to trail problems, and give aways. My background in human biology allows me to bring a "never stop learning" scientist's eye and teacher's heart to this endeavor. Expect well researched, well organized information that is too good to keep to myself. Take a peek at Hiking For Her's new creation for less than the price of a pound of "real" trail mix!